As you head back out of your house, Rowan explains the path to the mountain area has been restored. You can access the mountain area by going to the exit in the northwest corner of your farm. In the mountain area you'll see a lot of houses that need fixing up. Naomi and Sally suggest you go visit the dried-up spring where the Harvest Goddess is rumored to live. They also give you a map of Beacon Town. As you keep walking along the path, you bump into the mysterious purple-haired girl who originally helped you. Nova is glad that you are feeling better, and is even more pleased that you decided to stay and live on the island. After she leaves, you noticed that Nova left something behind; it is the third stone tablet! Or, at least part of the third tablet. You wonder if it will still work at the mosaic panel even if it is broken. It doesn't hurt to give it a try. If you keep walking up the path you'll run into a wonderful, magical, whimsical inventor named Doc. He declares that you will be his assistant, and your first task is to fix his house! As you walk back to the lighthouse, you bump into the mysterious fellow you had dreamt about before. He is surprised you can see through his cloaking magic. He introduces himself as Edmond. He's on a search for tablets. He asks if you too have been trying to restore the lighthouse. Maybe the two of you can work together? Edward wonders where the other half of your tablet could be, so he sets off to follow his hunch. Take the piece of the third tablet and set it in the mosaic. The only thing that happens is that Nova catches up to you. She's glad that you found what she dropped on the ground and is even happier that you had the same idea; that it is part of the lighthouse panel. You tell Nova about Edmond's theory about the other part being connected to water. Perhaps you can catch it while fishing? She heads out to check into it and suggests that you keep the tablet for now; she might just drop it again anyway. The bridge in the mountain is what you'll want to repair next. Spend 5 Softwood Lumber and 600 G to fix it up. You'll also want to repair the mine shaft, regardless of what the old man standing next to the mine entrance, Gus, tries to tell you! 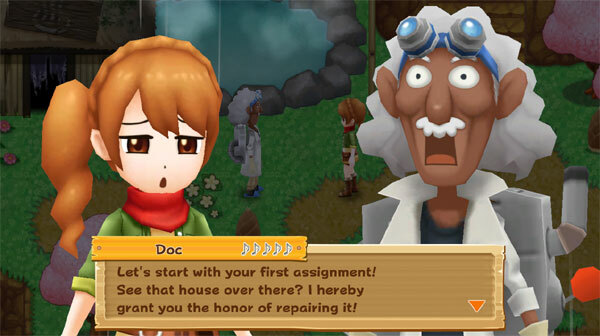 The mine repair costs 10 Softwood Lumber and 500 G. You'll also want to repair Gus' house near the mine, which costs 20 Softwood Lumber and 500 G.
The next day after fixing Gus' house, walk into the mountain are to meet Melanie, who just moved back to Beacon Town from the city. She suggests you go to the mine to talk to Grampy Gus. The old guy will complain about his back and asks that you go into the mine to collect some Iron Ore for him; he'll even give you a hammer! The mine will need to be repaired before he'll give you the hammer. Go into the mine and hit the dark-grey ore nodes until you find an Iron Ore, then go back to the surface and give it to Gus (simply talk to him to initiate the transfer). Gus heads back to his house (with your help) so he can do what blacksmiths do. Even Melanie thanks you for helping gramps back to their house. You try to give back the hammer, but Gus insists that you keep it. As you leave the house, you bump into the little orange Harvest Sprite of chillness, Flint. He's glad you brought life back to the mine and remembers something about a stone tablet. Flint says he must have given it to Dewy, although he's not completely sure because he had fallen asleep way back then. Rowan suggests that you start working on fixing Doc's house next to find Dewy. Gus' shop is open from 6:00 am until 6:00 pm starting the day after you help him back to his house. Now that you have the hammer, it is a good idea to start working on repairing the barn on your farm. It requires 20 Softwood Lumber, 2 Iron, and 1000 G. In the Special Edition (Ps4 or Switch) you'll need to own a mature Cow for its Milk to complete the fourth tablet. In all versions of the game you'll need to have a mature Sheep and have some of its Great Wool to complete the fifth tablet. It takes 20 days for a newly-purchased Cow or Sheep to mature into an adult. After you collect the proper materials, return to Doc's shabby shack and press the action button to open the fix-it menu. The next day, head back to the mountain area from your farm to bump into Doc. He drags you to his magnificent laboratory to show you some of his great inventions. He notices the tablet you are carrying around and asks if he could run some experiments on it. Before you can object, he kicks you out of his lab without the tablet so he can get to work. While you wait for Doc to finish his research with your third tablet, you're going to need some way of locating Dewy. In the main town area, just a little north of Naomi and Sally's house, is a run-down shack that needs some fixing up. Cyril's House requires 15 Softwood Lumber, 5 Stone, 3 Tulip (or 3 Great Tulip), and 1500 G to repair. The next morning you'll find a man passed out by your house! Cyril explains that he is very hungry, so open your bag and select an edible item to give him as a gift. Once recovered, Cyril tells you that he was the victim of fellow that he stopped to help, who ended up taking all his belongings and running off with them. He doesn't have much to reward your kindness with, but he does have a fishing rod for you! Take the fishing pole to a water area and cast in your line by using the action button. When you see a fish nibble on the line, leave it be until the bobber sinks into the water and the fish reel meter appears above your head. Then press the action button over and over until you reel it in; in this case, you will catch the broken piece of the third tablet instead of a fish! 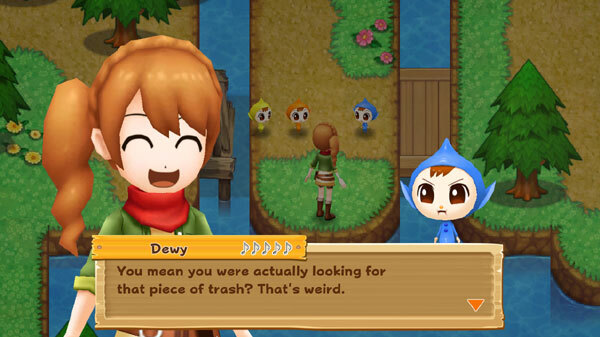 You'll also awaken Dewy the Harvest Sprite, who is very annoyed that someone had been throwing litter into the water. Turns out that someone was Flint, but he was simply following Gorgon's instructions. Gorgon is the king of the underworld and, in general, a very scary fellow. Flint didn't want to disobey Gorgon and face the underworld king's wrath. 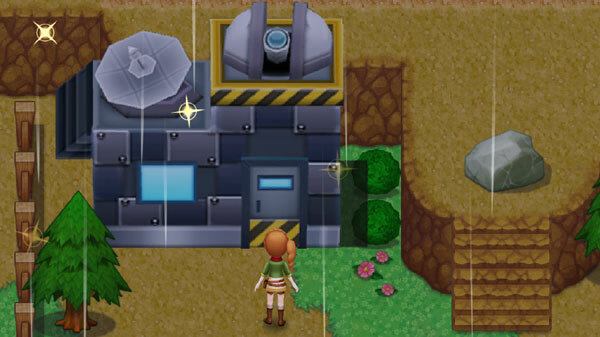 Head back to Doc's laboratory to hand over the missing piece of the stone tablet. Doc looks at both pieces but something isn't right. Turns out none of the glues that Doc has will put the two pieces back together. He sends you out to get materials for a new type of glue. You need to bring him 3 Iron Ore and 5 Glass Material. You can find these items in the ore rocks in the beginning levels of the mine (e.g., below floor 11). Bring the materials back to Doc and he'll glue the two pieces of the stone tablet back together. He reluctantly agrees to return the blue stone tablet to you, even though he hasn't finished his research. Take the whole tablet back to the lighthouse and place it in the floor panel. 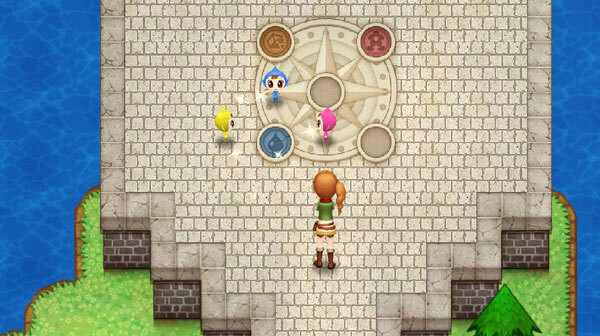 Rowan, Blossom, and Dewy will use their sprite powers to set the tablet, which lights up the third window of the lighthouse. NOTE that the in-game day will be over once the second tablet is activated. You will automatically go to bed after the window lights up.